Experience the charm and beauty of our New England Cottage Style Storage Cabinet! This Amish storage cabinet can be used as a curio cabinet, sideboard, pantry or bookcase. Please call with questions. Inspired by the distinct style in Cape Cod, Massachusetts, this Amish Storage Cabinet or Sideboard is ideal for a cottage or beach house! Be sure to ask our furniture specialist about our beautiful vintage distressing and antique packages! 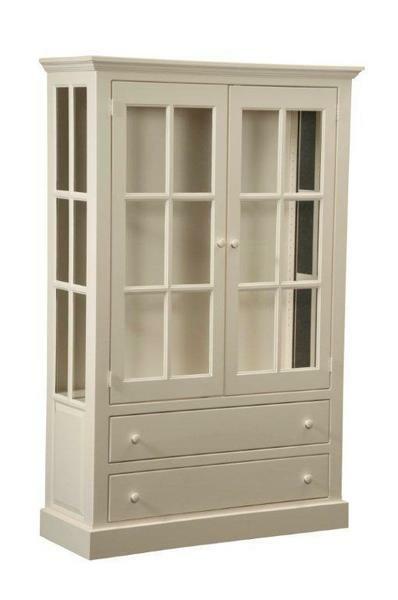 This curio cabinet is shown in our country white paint and features two adjustable shelves.